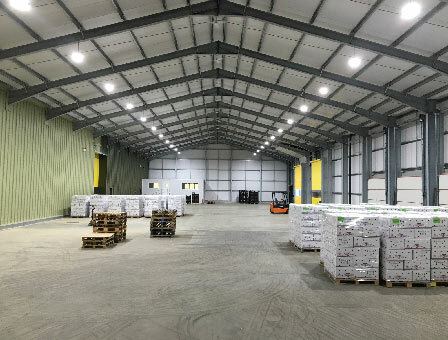 Taylors Bulbs, the fourth generation family bulb business based in Holbeach, Lincolnshire, has opened a new development to increase loading capacity in their peak seasons. The 5500m² development includes 1500m² of insulated warehouse space, the remainder being external yard for loading and storage. The warehouse includes three loading docks for loading directly into the back of vehicles, and two rapid-roll doors for loading curtain-sider vehicles. The business supplies flower bulbs to retailers throughout the UK and Ireland and farms around the Holbeach area. The engineering and design was overseen by Calvert, Brain & Fraulo of King’s Lynn and the building and external yard was constructed by MJS Construction, March, Cambs, taking only 4 months to complete. The car park was constructed by M.C.Nurse, King’s Lynn.